Another SCAM making money running a program or software or application on your computer. This one is call Viewearn.com If you’re thinking or planning to install it on your computer so you can make a few bucks, don’t! It’s a SCAM. For people already in the program a while back probably got paid one time and will never get paid again. 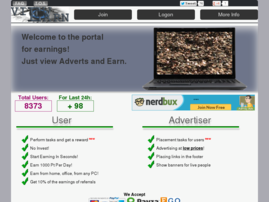 Viewearn.com trick, fraud, or SCAM is, they get many members signed up and run the program which uses about 20% of your CPU or system resources to advertise other websites, mostly PTC, also most are SCAM by the way. The program will sits on top of your computer or front screen blocking from what you’re doing in the back, which is very irritating. Now, when you get to $10 or so, which would takes few months even with the fastest computers, 3-4 months perhaps, then you request for payout, but you will notice it’s not paying. When you request, it said, payout request and sits there for a long time, a week later I tried to contact and ask why my payout payza have not been approved yet? no answer. So I follow up again 3 weeks later, and still no respond, not even a respond saying please wait or we’re processing in the next couple weeks, but simply nothing, nada, no respond from viewearn at all. The sent email about paypal will take long time, but the long time is never. So are the other payment processors such as Payza perfectmoney and so on. The sad thing is we cannot do anything about it, we cannot report them to paypal or payza because we didn’t pay them, they pay us for running program that wastes our electricity and annoying pop up blocking us from working on something else. I have notified all my referrals to stop running the software app program already, and I have hundreds active one. Share this so other people online can aware of Viewearn.com SCAM! This entry was posted in Make money online, Sad news, Scam Fraud Activities by admin. Bookmark the permalink.